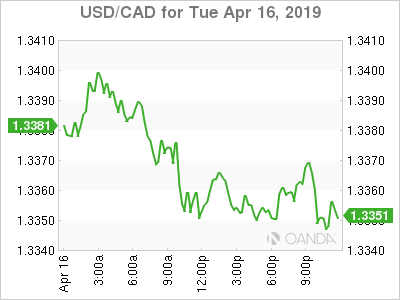 The rise in crude prices helped offset the dovish results from the Bank of Canada (BoC) business survey published on Monday. The loonie had a great start to 2019, but as major central banks are pumping the breaks so too has the BoC joined the dovish choir. Economic data is expected to be mixed going forward with the CAD traders awaiting inflation and trade data. The US dollar was mixed against major pairs on Tuesday. The greenback was lower against the AUD, NZD and JPY as Chinese data encouraged riskier assets. ECB dovish comments showcased a lack of confidence in the European economy despite the positive indicators this week taking the EUR lower. The GBP continues to be sensitive to Brexit headlines despite the Halloween extension. Opposition leader Jeremy Corbyn said that talks between the two major parties are stalling. The European Council has been supportive of more talks, and even of reversing Article 50, but the UK parliament has not rallied behind a single cause, leading to a vicious circle where a no-deal exit it not wanted, but supporting a single option is not viable. Oil prices rose on Tuesday as supply disruptions ended up boosting WTI more than 1 percent and Brent 0.7 percent. The API report showed a 3.6 million drawdown in crude stocks ahead of the report by the Energy Information Administration (EIA) on Wednesday. 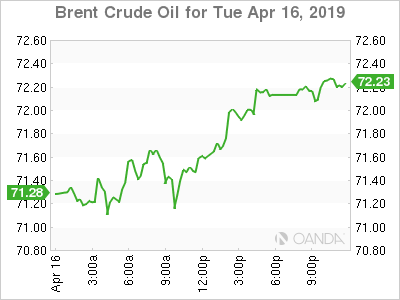 The forecast calls for a buildup in US crude inventories but after the mixed report last week, a drawdown would be positive for crude prices. The US dollar is gathering some momentum, after a dovish ECB, but not enough to derail crude. Oil prices could continue to climb higher if there is a significant drawdown of crude in the US. The OPEC+ deal continues to be the stabilizing factor that is pushing against rising US output. The disruptions have played in favor of the production cut agreement but have also made some members wonder if the time is now, before extending the deal, to start ramping up production. The Trump administration has shown a willingness to support the US energy sector, and with low oil prices as one of its main selling points shale producers could once again put the OPEC in a tough situation. Gold lost 0.9 percent on Tuesday. The yellow metal was under pressure as investors were seeking riskier assets and sold their safe haven positions. Lower inflation in the US also reduces the appeal of gold as the Dallas Fed outlined that the gig economy could be the x-factor keeping wages low despite a strong employment. 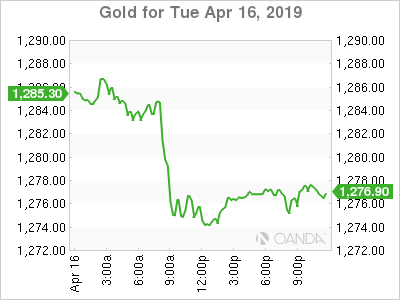 An extension to Brexit and positive comments on US-China and even US-EU trade deals have put gold on the back foot in the short term. Geopolitics will continue to create uncertainty that could eventually lead to gains on gold positions, but for now risk is the name of the game as the global outlook looks more stable. Global Indices had another positive session. Healthcare stocks in the US beat expectations and overall equities continue to defy analyst forecast of a slowdown. Updated guidance to the downside is partly responsible as the bar has been lowered, but companies are still posting positive results. 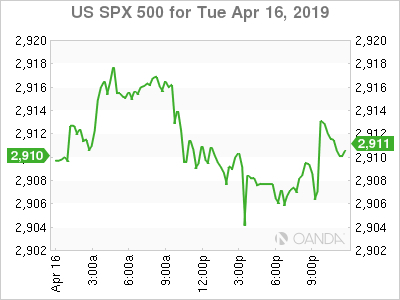 Apple and Qualcomm settled their patent lawsuit, which was a huge positive for the chipmaker rising 15 percent, while the iPhone maker ended up with a 1 percent gain after agreeing to pay and entering into a six-year chip supply agreement. Netflix fell after beating estimates on its Q1 earnings. It also added 1.74 million subscribers, but its future guidance was of only 0.55 earnings per share. The market was focused on increased competition in the space with Disney and Apple ready to step in this year. Netflix dismissed those concerns in a note seeing “We don’t anticipate that these new entrants will materially affect our growth because the transition from linear to on demand entertainment is so massive and because of the differing nature of our content offerings”. Analysts are not as optimistic on Netflix being able to fend off the threat from a content powerhouse like Disney and a hardware leader like Apple. Foreign exchange transactions carry a high degree of risk and any transaction involving currencies is exposed to, among other things, changes in a country's political condition, economic climate, acts of nature - all of which may substantially affect the price or availability of a given currency. Speculative trading in the foreign exchange market is a challenging prospect with above average risk. You must therefore carefully consider your investment objectives, level of experience and appetite for such risk prior to entering this market. Most importantly, do not invest money that you are not in a position to lose. In addition, trading on a margin basis means that any market movement will have a proportionate effect on your deposited funds. This can work for you as well as against you. The possibility exists that you could sustain a total loss of initial margin funds. OANDA's trading system is designed to automatically liquidate all open positions if your margin deposit is in jeopardy so that you cannot lose more than the funds you have on deposit in your account. It is encouraged that you employ such risk-reducing strategies as 'stop-loss' or 'stop-limit' orders, but you should be aware that market conditions may make it impossible to close out your order at the level specified. There are also risks associated with utilizing an Internet-based trade execution software application including, but not limited to, the failure of hardware and software. OANDA maintains back up systems and contingency plans to minimize the possibility of system failure. Your Margin Account with OANDA is not insured under any state or federal insurance program, or by any other entity. In the event OANDA should become insolvent or file for protection under the bankruptcy laws, it is possible that you would lose the entire amount in your Margin Account. Please be sure to read our complete Risk Disclosure Statement and contact us if you have any questions or concerns.